Sweet, warm, invigorating and slightly dizzying … mulled wine, called “Glühwein” in German, is a drink usually made from red wine (but sometimes white) and spices. An integral part of any self-respecting Christmas market, mulled wine has also become popular in recent decades outside Germany and the Scandinavian countries (where it is called «glögg»). The recipe is very simple and lends itself to almost infinite variations: In a saucepan, pour a bottle of red wine, 2/3 cup sugar, the juice and rind of one lemon, 2 cardamom pods, 4 cloves, 2 bay leaves and 2 cinnamon sticks. Heat over low heat for about an hour and voila! During the Quebec Winter Carnival, we serve a similar drink known as «Caribou», made from mulled wine mixed with hard liquor (gin, rum, vodka, whiskey, etc.). In any case, the end result is delicious, but beware! 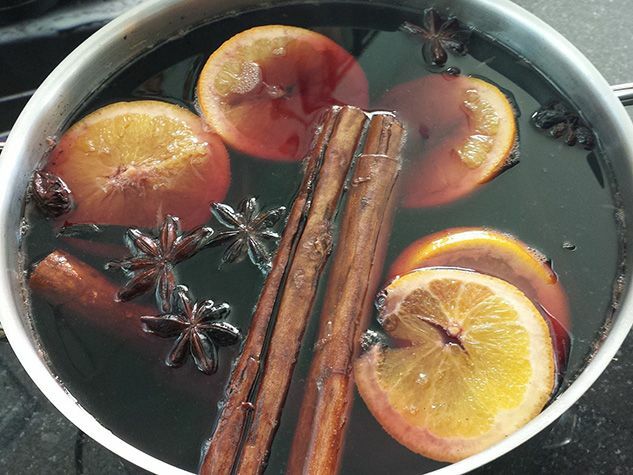 Glühwein can be somewhat deceptive: its warmth and gentle sweetness can make you quickly forget its alcohol content. So it is all too easy to drink a little too much and regret it bitterly the next morning! Originally published in the Journal de Montréal on December 13, 2012.